Back cover blurb: No-one is who you think they are. Sophia's parents lead quiet, unremarkable lives. At least that is what she's always believed. Everyone has secrets. Until the day she arrives at her childhood home to find a house ringing with silence. Her mother is hanging from a tree. Her father is lying in a pool of his own blood, near to death. Especially those closest to you. The police are convinced it is an attempted murder-suicide. But Sophia is sure that the woman who brought her up isn't a killer. As her father is too ill to talk it is up to Sophia to clear her mother's name. And to do this she needs to delve deep into her family's past - a past full of dark secrets she never suspected were there . . . What if your parents had been lying to you since the day you were born? When Sophia is called late one night by her Mother urging her to come home, she doesn’t pay too much attention. Since Sophia left home to take up a high flying job in London, her Mother’s calls have been regular and needy, with no real purpose. In any case, even if Nina’s urgent call had any genuine value, she would still need to wait until the following morning, as Sophia is out with work colleagues drinking, and in no fit state to drive. When Sophia arrives at her parents house the following morning she is devastated to find her Mother hanging from a tree and her Father critically injured beside. Sophia’s initial reaction is obviously shock, but the police’s insistence that they don’t need to look for anyone else in connection with the “situation” doesn’t sit well with her. There is no way on this earth that her Mother would kill herself, and most definitely not attempt to murder Sophia’s father. As her father fights for his life in hospital, Sophia is drawn into the police investigation, finding a letter inside notebooks from her mother, that suggests all might not be as it seems. As Sophia begins to read her Mother’s notes she realises that her younger years were not as Nina had ever described them to her. Nina was involved with rock star Aaron Kessler and some other interesting characters in her university days. 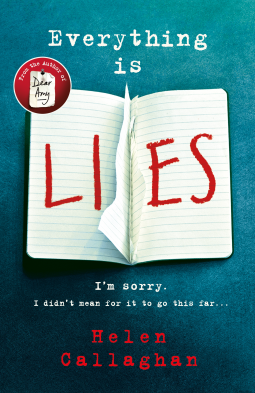 Everything Is Lies is available now via Amazon online and all good book shops. Thank You to the publishers who invited me to read this novel in exchange for an honest review.